Ottobock, a world leading supplier of innovative solutions for people with limited mobility, has launched C-Leg 4, the fourth generation of the worlds first completely microprocessor controlled leg prosthesis. Since its inception in 1997, C-Leg has set the standard for microprocessor knees and every iteration since has continually improved the functionality and benefits for the user. Over 60,000 people have been fitted with C-Leg over the past 3 decades. 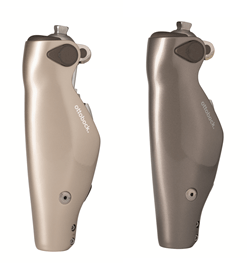 The new C-Leg 4 is available in two colours and enters a new era with its additional features, including real time swing phase control fuelled by 3D motion analysis and strengthened stumble recovery support. Another highly beneficial feature for amputees is the new standing function. This recognises when the wearer has stopped and dampens the knee in a slightly flexed position to provide maximum stability and comfort. Walking backwards has also never been easier than with C-Leg 4. The new and improved weatherproof prosthesis helps people master everyday life more confidently with two additional modes. The knee can be adjusted to meet an individual’s specific requirements for unique activities such as cycling, dancing or playing sports. For the first time, users can quickly switch between modes and monitor battery life using the new ‘Cockpit’ app for Android smartphones. The optional remote control also supports this functionality and both options integrate Bluetooth technology. “The latest incarnation of the C-Leg provides the safety that has been synonymous with the C-Leg name”, explains Rachel Neilson, Ottobock UK Academy. “Being able to stop and stand still without thinking, change your speed of walking, or take a step backwards should not be a luxury and the C-Leg 4 provides all of those safely and predictably so that the amputee can just get on with what they want to do. Watching someone regain their independence and go places they never thought possible is just amazing. Without innovative and brilliant products like the C-Leg 4 this just wouldn’t be possible”. The C-Leg 4 can also be combined with the new Triton Smart Ankle providing a state of the art solution for trans-femoral amputees. For more information on Ottobock’s range of innovative solutions that restore mobility please visit www.ottobock.co.uk or follow @ottobockuk.